Found a very artistic longboard, with a “simple” design and a luring eye on it. This drop deck longboard is very art-fully crafted with a clean design. Something you don’t see a lot on this space with fast boards and bright colors. 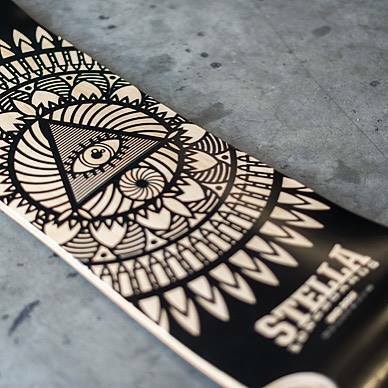 Here they use simple black on white to convey a great symmetrical design on a symmetrical longboard. A freeride board which set the mind free to roam around. This entry was posted in art, design, drop down longboard and tagged drop deck longboard, stella longboard, uno dose by Marlene. Bookmark the permalink.